? of the Day: Is air pollution in the region becoming better, staying the same or becoming worse?
? 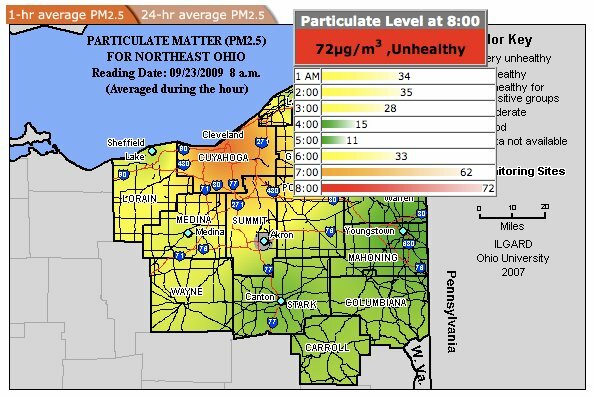 of the Day: How often do you notice the pollution in NEO in your neighborhood? After reading your message, I'm concerned about the human impacts of pollution in northeast Ohio. Independence of the day: May the people of NEO find freedom from "Cleveland Works"
Question of the day: Why are we wrecking our environment? Texas regulators are failing to properly monitor, control and enforce federal emission standards! Like in Ohio?! What made the Ozone levels around Brewster so unhealthy last night? Origins of realNEO: CAUSE For Cleveland - "Dear fellow University School Alumnus"
Submitted by Norm Roulet on Wed, 09/23/2009 - 07:34. There is clear evidence the leadership of Northeast Ohio has failed to create an environment encouraging world-class monitoring, analysis, research, notification and controls of pollution created in our region of Ohio, and the consequences on residents and society. As a result, the people of this region have suffered significant health consequences, including early death, and impaired learning ability, crippling our schools and workforce, and society and the regional economy have suffered greatly. As much of our pollution is exported beyond our region, our failure to be world-class addressing pollution here causes harm world-wide. As an early member of the Greater Cleveland Lead Advisory Council, and co-chair of its Infrastructure and Sustainability sub-committee, I have seen our community make significant progress addressing our crises here with lead poisoning from many sources, although not lead poisoning from ongoing polluting in the region. We must address this challenge with an expanded strategy for cooperative community environmental planning and remediation, best demonstrated by GCLAC, by creating a North East Ohio Pollution Advisory Council (NEOPAC). I believe the subcommittee structure of GCLAC is complimentary to the structure required for NEOPAC, consisting of a steering committee and subcommittees addressing Infrastructure and Sustainability, Outreach and Advocacy, Housing and Environment, Workforce, Medical, and Education. I suggest we add "Legal" and "Government" sub-committees to the mix, for NEOPCA and GCLAC. To optimize value in these critical sectors, I have recommended Cuyahoga County convene and sponsor overarching Greater Cleveland Food and Information Advisory Councils, like and associated with the Greater Cleveland Lead Advisory Council, and county leaders should take active roles leading the councils and in planning these multi-billion-dollar sectors of our economy and society... we must not entrust the leadership, innovation, financial engineering and decision-making control to under-engaged government and over-engaged foundations, academe, industry and non-profits. Planning these sectors should not happen behind closed doors in any ways at all, as has been the case in the past. There are efforts to use a council structure for local foods, but those efforts are compromised by self-interests of polluters. By co-opting the local foods sector in this way, one of our greatest opportunities to grow the new economy for this region has been corrupted. From discussions with attorneys who are experts in environmental law and justice, it is evident that the local governmental pollution controls, our "environmental" movement, and our systems for addressing the crisis of air and water pollution in our region have likewise been co-opted by polluters. For five years, the GCLAC has effectively addressed most aspects of lead poisoning in our community with enough diversity and depth of regional, function knowledge, strength and integrity to not be entirely co-opted by those who have caused our lead contamilnation issues, like Sherwin Williams, Mittal, and their powerful attorneys. I believe the GCLAC has the best organizational model for addressing pollution in Northeast Ohio, and has the collaborators necessary to address pollution already united for complimentary purposes. In fact, a NEOPAC will add knowledge about lead poisoning from pollution to the resources of GCLAC, in addressing the lead poisoning of our residents. I encourage anyone interested in helping to organize a NEOPAC, and VOLUNTEER to actively participate on that council, to post your interests here or contact me at norm [at] realneo [dot] us. NAYMIK -MARY ANNE SHARKEY this is for you! Remind me again - why was Joe Cimperman indicted and Brancatelli is not? The PeeDee ran a poll about OccupyWallstreet. Let's do one and compare results.
? of the day: Who are your favorite local artists? Home » The Origins of REALNEO » ? of the Day: Is air pollution in the region becoming better, staying the same or becoming worse?